In their third disc for Hyperion, the acclaimed vocal ensemble Cinquecento continue their exploration of the rich repertoire engendered in the Habsburg court. The prolific composer De Monte, Kapellmeister to the Emperor Maximilian II, wrote over a thousand madrigals as well as hundreds of sacred works, and the expressive aspects of the madrigal infuse his sacred music delightfully. 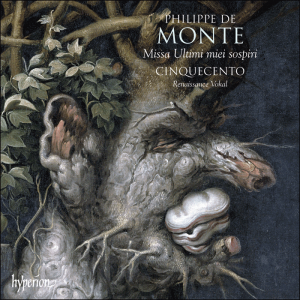 His Missa Ultimi miei sospiri contains the constant interplay between groups of voices and dramatic word-setting which are features of the madrigal genre. The motets recorded here cover many Biblical and liturgical subjects and demonstrate the wide range of techniques and styles used by the composer.